Before we get teary eyed with joy or scoff with derision, we should take a closer look at President Obama’s June 25 speech on climate change, and set it within the context of his five years in power. This is a position he himself argued for during his speech when he said that we need to “be more concerned with the judgment of posterity” than short–term political considerations. So is Obama, in the words of World Resource Institute President Andrew Steer, really “resetting the climate agenda” and can we honestly say that “it’s a wonderful thing to see that he is really reclaiming this issue"? While many other environmentalists, including Bill McKibben of 350.org, are fervently hoping that this is true, history and facts demonstrate otherwise. Obama’s dismal domestic and international track record on environmental issues—it was, after all, he who was the lead protagonist in wrecking the international climate talks in Copenhagen in 2009—and his commitment to U.S. imperial power as a representative of American corporate interests surely point toward the need for a greater and more thoroughgoing critique than a character assessment of the man himself allows for. With a more systematic, broader analytical framework, unimpeded by misty visions of an Obama rebirth as a climate champion, one immediately recognizes the inadequacy of his Action Plan On Climate Change to keep the planet below the critical threshold of 2 degrees Celsius of average warming. This needs to be acknowledged, even as we welcome the fact that—after a five–year hiatus, including a re–election campaign where he never even mentioned climate change—Obama has been forced to re–engage with the central issue of our time by the power of grassroots protest, even to the extent of referencing the divestment movement and the fight against the Keystone XL pipeline. Rather than celebrating Obama’s renewed “commitment” to environmental action, we should recognize it for what it is: After five years of doing all he can to promote fossil fuel production, it’s the first, timid, grudging response of the U.S. state to the growing environmental movement against Obama and all that he represents: the economic, political and military priorities of U.S. imperial power. The Pentagon knows that environmental, economic and other crises could provoke widespread public anger toward government and corporations in coming years. The revelations on the NSA’s global surveillance programs are just the latest indication that as business as usual creates instability at home and abroad, and as disillusionment with the status quo escalates, Western publics are being increasingly viewed as potential enemies that must be policed by the state. There is, therefore, the overriding requirement that we continue to build the movement independent of the limitations imposed by the Democratic Party, until we achieve the kind of changes that are actually necessary to prevent catastrophic climate change, by stitching together all forces aimed at this objective. The biosphere of which humans are a part cannot afford half measures or rely on dubious “friends” in high places. Nor can we set our sights any lower than the swift dismantling of the fossil–fuel infrastructure of death and its replacement with publicly owned and democratically controlled clean energy systems. As many studies have shown, this is eminently doable with current technology and will create millions of worthwhile jobs through the generation of genuinely renewable energy from sources such as wind and solar power, alongside massive energy efficiency and conservation measures. Such a transformation is far less utopian than believing that capitalism can solve the problem that it created. Such a transition cannot mean a continuation or expansion of the criminal agro–fuel production, still less the increase in natural gas production through fracking, the continuation of nuclear power and the entirely ridiculous concepts of “clean coal” and carbon capture and storage, all of which Obama includes as part of his planned solution—his “all of the above” strategy. The fact that Obama is using executive authority to attempt to push through some changes to U.S. energy and climate policy, most significantly new rules on existing power plants, is a reflection not of strength, but of his preceding weakness on the issue, turning it from a positive into a negative, as the right wing has made all the running. Notwithstanding the catastrophic climate change that levels above 350 ppm of carbon portend and have already initiated—as droughts, floods, crop failures, super–storms and wildfires become the “new normal” across the globe from Australia to India, from the U.S. to Pakistan—politicians across the political spectrum greeted the news of 400 ppm of carbon earlier in May with a giant shrug of collective indifference. While on the one hand Obama’s action plan doesn’t require Congressional approval, and that can be seen as encouraging in the face of an utterly recalcitrant Congress, it is also a flaw. The new rules will be vigorously challenged in the courts, and as and when the other corporate party manages to work out how to win an election again, they can be overturned just as easily, assuming they have even been implemented. It needs to be highlighted that, in contrast to how Democrats and Obama like to portray the issue, it is not a solidly partisan one. While elected Republicans are certainly more likely to be climate–change denialists, the reality is that things are much more regional and dependent on which state a political representative is from. A much more reliable indicator of whether a state’s Representative is pro– or anti– climate change policy and clean energy, is whether the state’s economy is directly connected to fossil fuels or ethanol production, than whether they are Democrats or Republicans. And on the ground, where people are forced to deal with the growing ramifications of climate change and the disruption and cost to their lives, the picture is very different. As reported in a recent survey of self–described Republicans and Republican–leaning independents, 62 percent said the U.S. should address climate change, and 77 percent said that the U.S. should use more renewable energy sources. This is all the more remarkable given that virtually no political representative from either party has been arguing for these things, and they have certainly not appeared on the TV screens or in the newspapers of the mainstream media. South Florida has two big problems. The first is its remarkably flat topography. Half the area that surrounds Miami is less than five feet above sea level. Its highest natural elevation, a limestone ridge that runs from Palm Beach to just south of the city, averages a scant 12 feet. With just three feet of sea–level rise, more than a third of southern Florida will vanish; at six feet, more than half will be gone; if the seas rise 12 feet, South Florida will be little more than an isolated archipelago surrounded by abandoned buildings and crumbling overpasses. And the waters won’t just come in from the East—because the region is so flat, rising seas will come in nearly as fast from the West, too, through the Everglades. Quoting Harold Wanless, the chairman of the department of geological sciences at the University of Miami, Goodell writes, “Miami, as we know it today, is doomed…It’s not a question of if. It’s a question of when." Of course, the other very “big problem” Florida has is that it is the epicenter of climate change denial, with Florida Sen. Marco Rubio, Gov. Rick Scott and assorted other representatives unmoved by the overwhelming scientific consensus on anthropogenic climate change nor on the reality of their sinking state. The fact that southern Florida, including unique ecosystems like the Florida Everglades, is on track to become a giant underwater theme park is not an isolated phenomenon; many of the world’s largest cities are low–lying ports, and 100 million Americans live within 3 feet of (current) high–tide markers. New York City is still recovering from the climate change–enhanced Superstorm Sandy, which, apart from poor or nonexistent planning, was all the more devastating because, as Obama finally noted, sea levels are already 12 inches above where they were 100 years ago—and the process is accelerating. Into this context stepped the most powerful man on the planet, President Barack Obama. Promising to “halt the rise of the oceans,” his swirling rhetoric is a match for the fiercest hurricane. It was impossible not to be moved by Obama’s opening remarks, forcefully detailing the perilous condition of our planet, atmospheric pollution and the changes already wrought by global warming from the unrestrained burning of fossil fuels and the resultant increase in atmospheric carbon dioxide concentrations. But just as importantly, it also raised the question: Where has he been for the last five, wasted years? And if he really believes all that, why is he still equivocating on Keystone XL and signing off on the need for an immense expansion of U.S. corporate and military might in the Arctic to facilitate fossil fuel and mineral extraction? Obama’s actions over the last five years in power—during two of which, the Democrats had super–majorities in both houses of Congress—even to his most fervent supporters, have been a damp squib. From boasting about laying enough pipeline to circle the earth “and then some,” to presiding over the massive expansion of coal exports and giving the presidential seal of approval to the further exploitation and development of the Arctic in competition with Russia and other nations, Obama, despite some much–belated moves on fuel economy standards, has quite clearly sided with the fossil fuel industry. His call for the Department of Defense to be run on renewable energy is hardly the way to preserve the planet. Team Obama’s catastrophic climate silence—a silence his White House inanely imposed on much of the progressive and environmental establishment back in 2009 (see here)—coupled with his utter failure to push hard for a Senate vote, has turned a winning political “wedge” issue into something that is mistakenly perceived to be a political loser by much of the political establishment. His embrace of an “all of the above” energy strategy, which is to say no strategy at all, has legitimized a massive expansion of fossil fuel production—and export. His lack of action in the face of increasingly obvious climate change–related weather events, which legitimizes the continued expansion of fossil fuel production, fracking and exploitation of the Arctic and offshore drilling, and the fact that the U.S. continues to fall behind other countries in the adoption of clean energy systems as a result of Obama’s “all of the above” energy strategy helps explain why many environmentalists have become increasingly disillusioned with Obama. However, sections of even the mainstream environmental movement have been forced to adjust their priorities due to the impatience and anger of their membership, and, over the last few months, move toward a more confrontational stance with regard to the president they once unequivocally regarded as sympathetic to their interests. Now is not the time to backtrack and cuddle up to the Democrats, but to forge forward with implacable resolution, building resistance, protests and organization all across the country, while establishing solidarity with those in other countries fighting their own governments’ corporate priorities. Since the re–election of Obama, the environmental movement is the only social movement to date to pull off a national demonstration in the tens of thousands—in Washington, D.C., in February, and it has put hundreds of people on the streets to bird–dog Obama wherever he turns up, in order to voice their opposition to the Keystone XL pipeline. A new movement for campus divestment from fossil fuels has sprung up on hundreds of campuses in a matter of months, and the anti–fracking movement continues to grow all across the country. The reason Keystone XL has not already been permitted, therefore, and why the Obama administration has repeatedly delayed its decision, despite its self–declared approval, must be put down to the force of protest by newly invigorated environmentalists. To quote Romm once more, “If Obama truly were the ‘environmental president,’ then Keystone would be a very, very easy decision for him,” and would make protesting him unnecessary. The change in the political dynamic has created the space for more radical and left–wing arguments to gain traction, with wide layers of activists around the slogan of the new group System Change, Not Climate Change: The Ecosocialist Coalition, which argues for complete independence from the Democratic Party and an emphasis on the systemic nature of the ecological crisis—and thereby the need, ultimately, for a completely different kind of society not driven by profit, warfare, racism and continual expansion. Given that tar sands are widely recognized to be far more polluting than even regular oil extraction and processing; that the ripping apart of Indigenous lands and boreal forest large enough to be seen from space; and that the deposits are as large as Saudi Arabia and if developed represent “game over” for the planet, according to climate scientist Dr. James Hansen; the immediate next words from Obama’s lips should have inevitably consisted of: “and that’s why I’m not approving Keystone XL.” Instead, a deafening silence ensued. If you’re serious about stopping global warming, you need to veto the Keystone XL pipeline. If you’re serious about regulating carbon emissions, establish a fixed and immediate limit, as has already been done for arsenic, mercury and other pollutants. That limit should be 350 ppm. The EPA, which already has the authority, can then work with the states to see how they will manage to make it happen. If you’re serious about moving away from dirty energy, then there needs to be a strict timeline established for the complete phasing–out of all coal and nuclear plants by 2030 and their replacement, not with natural gas or nuclear, but with wind and solar power. If you’re serious about addressing climate change due to deforestation and helping other countries, then subsidies to ethanol production, which diverts cropland from food to fuel, must end, and all debt owed by developing countries must be forgiven. If you’re really serious about carbon pollution, you can’t with any honesty discuss solutions without making massive cuts in military spending. The Department of Defense is responsible for 80 percent of the U.S. government’s energy consumption, and the U.S. military is by far the biggest polluter on the planet. Radical reductions in spending on the Pentagon are essential for human survival. You made no mention of the need for enormous investment in and expansion of public transit. If you’re serious about addressing climate change and making our cities more livable and the air more breathable, you will take the money you just saved by cutting military expenditures and apply it to the construction of new rail, light rail, tram and bus services, between and within cities, obviating the need for cars. If you’re really serious about connecting social and ecological questions, along with extra investment in public transit, you will fight for the institution of more progressive taxation and higher taxes on the mega–rich to pay for all the other necessary investments in critical infrastructure. Along with a new electricity grid, this will include such things as free universal child care and quality public education, in order to furnish the educated and informed young minds we need to build a sustainable future. In reality, we’re not going to get anything remotely like the points above without the growth and development of a massive social and ecological movement for change. We must take heart from the results of our efforts so far to more vigorously challenge the Obama presidency, and build on them without illusions that Obama has finally come to his senses. Sadly, as a result of this one speech, though it came amid years of actively undermining climate regulations and promoting fossil fuel production and militarism, many well–meaning environmentalists and mainstream environmental NGOs will hop back on board the Obama fossil–fueled bus. The radical wing of the environmental movement must seek to push for a continuation of confrontation with the priorities of corporate capitalism and its political representatives in Congress and the Whitehouse. What we should be doing is taking a leaf from the protest pages of the people of Turkey and Brazil. They have shown, if ever we needed more evidence, that mass protest uniting social and ecological demands into one unified movement independent of mainstream politicians has the power to change state policy at the national level. Furthermore, mass protest can affect thoroughgoing and immediate change in a matter of days, while all the lobbying and backroom operating in the corridors of power took years to accomplish far less. In the run–up to his visit, Bongani Masuku, COSATU’s international relations secretary, commented: "Obama is perpetuating American foreign policy. The U.S. is an empire run on behalf of multinational companies and the ruling class of America. U.S. foreign policy is militarizing international relations to sponsor and make their own weapons." not disappointed because I didn’t expect anything. It’s not about the individual; it’s not about the race he came from. It’s about the class he represents. It’s like he’s the gatekeeper for white monopoly capital. He promised things we knew he wouldn’t be able to do. These are words we would do well to learn from in the U.S., as we redouble our efforts, build on our successes and fight the entrenched corporate interests that Obama so faithfully represents. 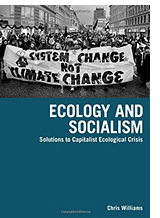 Chris Williams is a long-time environmental activist and author of Ecology and Socialism: Solutions to Capitalist Ecological Crisis (Haymarket, 2011). 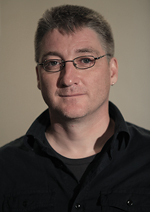 He is chair of the science dept at Packer Collegiate Institute and adjunct professor at Pace University in the Dept of Chemistry and Physical Science. His writings have appeared in Z Magazine, Green Left Weekly, ClimateandCapitalism.com, Counterpunch, The Indypendent, Dissident Voice, International Socialist Review, Truth Out, Socialist Worker, and ZNet. He reported from Fukushima in December and January of 2012 and was a Lannan writer-in-residence in Marfa, Texas over the summer, where he began work on his second book on the Commons. He was recently awarded a Lannan Cultural Freedom Fellowship to continue this work..
STOP: Another One Hundred Years of Fossil–Digging in North America?